- Publisher A book of on-the-page puzzles, games and stories, with a page of stickers to use to complete the activities throughout, this book will provide hours of fun for little ones in the run-up to Christmas. This book forms part of the My Very First series, featuring Alex Ayliffe's characteristic paper collage illustrations. 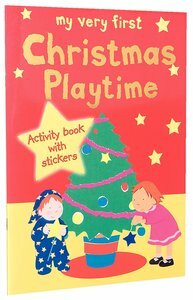 About "My Very First Christmas Playtime"
A book of on-the-page puzzles, games and stories, with a page of stickers to use to complete the activities throughout, this book will provide hours of fun for little ones in the run-up to Christmas. This book forms part of the My Very First series, featuring Alex Ayliffe's characteristic paper collage illustrations.